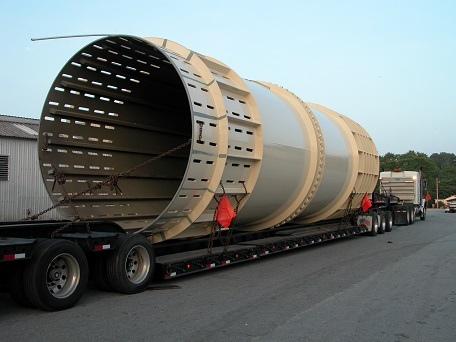 DRUM SHELLS: The centerpiece of our debarking systems, Fulghum drums have inside diameters ranging from 9 ft. to 16.5’. Steel in these shells range in thickness from 3/4 in. to 2 in. Drum length, depending in part on the retention time required, vary from 30 ft. to 120 ft.
BARK SLOTS: The number and sizes of these openings vary with the species of wood to be debarked. Openings are cut with a plasma torch to minimize stress on the shell. LIFTERS: Angle iron or formed steel lifters are installed with continuous submerged arc welds. In addition to facilitating debarking action, these lifters add rigidity to the shell. Rubber lifters may also be installed. DRIVES: Rubber tired drives are used to rotate all Fulghum drums. The many advantages of these drives include shock absorption, reduced noise and maintenance, improved speed control and the ability to "soft start" the equipment in ramping up. INFEEDS: Infeed options include economical chutes available in standard or enlarged widths and a conveyor infeed with which operators can use a crane or a mobile loader. THRUST ROLLERS: Steel thrust rollers limit the lateral movement of the rotating debarking drum and help maintain equipment balance. BARK HOPPERS: Steel bark hoppers, which Fulghum may equip with life extending wear plates, surround the lower two-thirds of the drum. DISCHARGE GATE: Fulghum designers employ a horizontal gate to help regulate retention time and discharge of stems from the drum. Most of these gates are adjusted seasonally. DEBARKER DISCHARGE: The Fulghum debarker outfeed varies with site specific applications. ENVIRONMENTAL SAFEGUARDS: Fulghum debarking systems are designed to optimize noise and dust abatement through dampening technologies and enclosures.